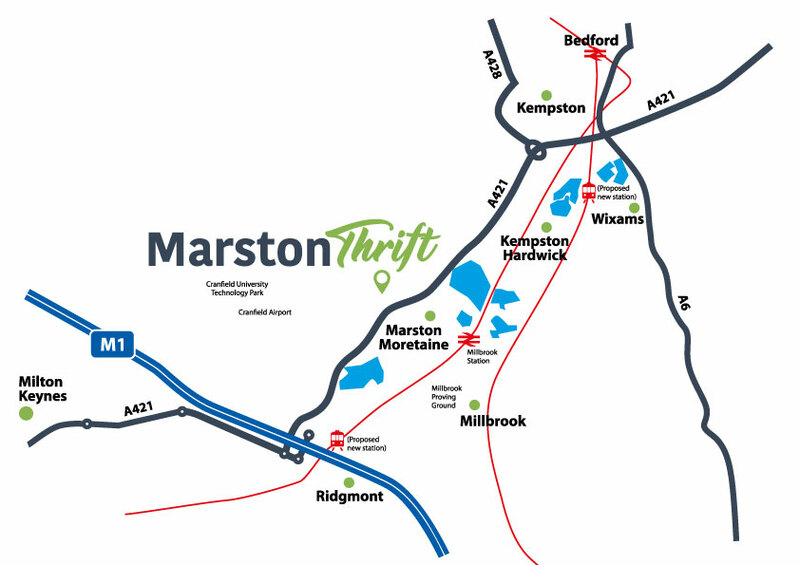 Marston Thrift is well located for connectivity to local towns whether it by foot, road or rail meaning less time travelling and more time at home and at leisure. Various employment opportunities are easily accessible from the site, including the research and development facilities located nearby at Cranfield University and Science Park and Millbrook Proving Ground. Download the indicative masterplan of the development here. The site lies within the Cambridge-Milton Keynes-Oxford Arc, a nationally important corridor for innovation and economic growth. Marston Thrift benefits from a location immediately adjacent to the A421, recently dualled in 2010 as part of the Department for Transport’s Oxford to Cambridge (O2C) Expressway to provide improved strategic accessibility and free up local highway capacity. Marston Thrift is served by a number of existing bus routes, with stops on Beancroft Road and Lower Shelton Road. The site is sited directly on an existing bus link (Service 53) between Bedford, Marston Moretaine and Cranfield, providing a real choice for how residents can travel to destinations including Cranfield University and Science Park, Magna Park and Bedford. Additional bus stops and an increase to some of the existing services will be provided as part of the development, alongside a dedicated ‘Park and Change’ facility within the community hub acting as a local park and ride facility that could support an express service between Milton Keynes and Bedford. Stagecoach supports this site: “making the fullest possible use of public transport in line with guidance from the National Planning Policy Framework", and should be allocated for development in the local plan to help meet housing requirements to 2036. East West Rail provides an opportunity for this location to benefit from integrated road and rail connections, with a new station and park and ride facility planned at Ridgemont. A new 4 platform station, with car parking and ancillary facilities is also planned on the Midland Mainline at Wixams. Local rail provision is provided by the existing Millbrook station. 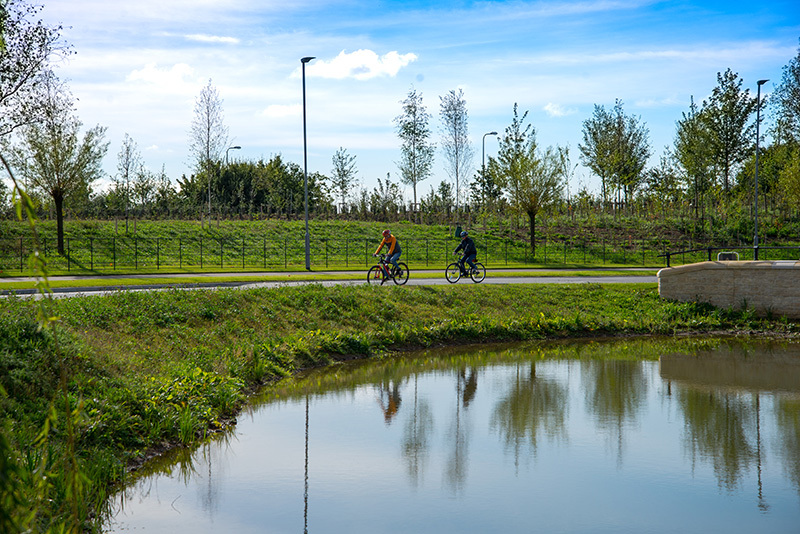 National Cycle Route 51 runs close to the site and provides links to both Milton Keynes and Bedford. Numerous Public Rights of Way cross the site and there is a comprehensive footpath network within the surrounding countryside. This includes footpaths within the Marston Vale Country Park, which is accessible from the site via an underpass near the north-eastern corner of the site at Lower Shelton.